The Drive Aluminum Rollator is a terrific aid for people with limited mobility. The special lever lock on the rolling Rollator protects fingers from "snapback" injuries when brake is released. The design is durable with wrap-around welds for reinforced strength and support. 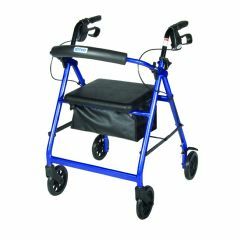 The Rollator comes with a zippered pouch that can be mounted under the seat. Handle height adjustable. Easy, one-hand folding. 6-inch casters with soft-grip tires give greater traction and mobility both indoors and outdoors. 6" black, non marring casters with soft grip tires are ideal for indoor and outdoor use. Comes with new seamless padded seat (14" x 14") with zippered pouch under seat. Supports Weight. Well Constructed. Safe. Stores Easily. Easy To Use. Lightweight. If I had known how much this would change my life, I would have bought one long ago! Now, instead of a shaky walk, holding onto walls and counters when I simply had to get to the kitchen, I am zipping about the house all I like. My doctor is happy with the additional exercise I'm getting, and I feel very secure. I'm no longer worried about carrying anything, because whatever won't go into the sturdy bag below the seat can go on the seat itself (like a plate of dinner). My husband (primary caretaker) is much less worried when he must be away. I also love that it rolls so effortlessly and smoothly. Add to that, a stable seat when I need a rest. Well Constructed. Easy To Use. Supports Weight. Stores Easily. Safe. Indoors. Short Distances. Outdoors. Long Distances. Wet Weather. Use it daily during ambulation. Lite weight. Easily foldable. by Active roller from Pico Rivera,Ca. Well Constructed. Supports Weight. Stores Easily. Easy To Use. Safe. Indoors. Outdoors. Long Distances. Wet Weather. Short Term User. accidents happen. Well Constructed. Easy To Use. Supports Weight. Stores Easily. Safe. Lightweight. Best price around. Indoors. Outdoors. Short Distances. Long Distances. Wet Weather. Makes a great indoor tray. Long Term User. Elderly. Active @ 83.
what is the weight, out of the box? I did not actually weigh the Rollator, But it is light enough for this 72 year old man to lift in and out of a car. Do these Drive Rollators come delivered assembled? Can you give locations in the Saco, Maine area where these rollators may be purchased? I remember that the Drive Rollator I received was mostly assembled, but needed a little work to remove it from the shipping box and unfolding it to be used by my wife. a few items were added to it by the instructions it has. what is the dimension of the box? what is the weight of the product? Is it possible to get a brake spring to repair a lost one? My mother has one of these walkers. The problem we are having is her portable oxygen tank is heavy and has completely destroyed the underseat basket. Do you have replacements or suggeswtions for what can be used instead? can this be used as a knee walker? or do you have to be able to walk to use it? You need to be able to walk to use this. You need a "knee walker" instead.